This study evaluates serum copper and magnesium and total antioxidant capacity levels in PCOS patients. 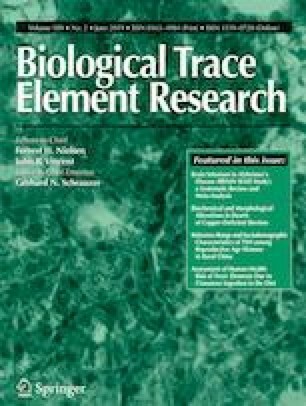 In this regard, the probable association of copper and magnesium with total antioxidant capacity (TAC) was investigated. In total, 150 women (60 PCOS patients and 90 healthy subjects) participated in this case–control study. PCOS was diagnosed according to the Rotterdam criteria (2003). Serum Cu, Mg, Ca, TAC, insulin levels, and insulin resistance indices were determined. Insulin was measured using ELISA methods. Serum Cu and Mg levels were measured by an atomic absorption spectrophotometer and the Xylidyl Blue method respectively. The correlations between the parameters were analyzed using the Spearman correlation test. Serum Cu level was significantly higher while TAC was significantly lower in the PCOS patients than those in the controls (p = 0.019 and p = 0.002 respectively). No significant difference was detected between the two groups in terms of serum Mg and Ca levels and Ca/Mg ratio. In insulin-resistant PCOS subjects, there was a negative correlation between Mg levels and homeostatic model assessment for insulin resistance (r = − 0.449, p = 0.006) but a positive correlation between Mg levels and quantitative insulin sensitivity check index (r = 0.480, p = 0.003). A negative correlation also existed between Mg levels and TAC in non-insulin-resistant PCOS patients (r = − 0.407, p = 0.04). According to the results, copper and magnesium seem to contribute to oxidative stress and insulin resistance in PCOS patients. Therefore, to prevent long-term metabolic complications in PCOS women, it is recommended that these elements be routinely monitored. Also, significantly lower levels of serum TAC in PCOS patients than in normal women may suggest increased oxidative stress in such patients. We would like to thank the participating patients as well as the staff of Fatemeh Zahra Infertility and Reproductive Health Research Center for their valuable cooperation with this project. We are grateful for the financial support granted by Babol University of Medical Sciences, Iran. Approval was obtained from the ethics committee of Babol University of Medical Sciences (MUBABOL.REC.1394.65). All the participants were informed of the aims of the study, and informed consents were obtained from them. The biochemical tests had no cost for the participants, and the results of these tests were reported to them.